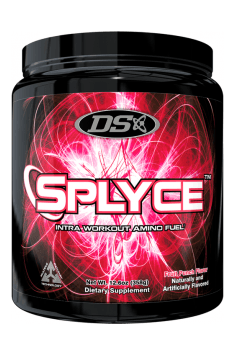 NEW Splyce™ by Driven Sports is an intra-workout fuel that is based on branch-chain amino acids (BCAA), with a supporting cast of ingredients that have been shown to promote muscle building and enhance muscle volume. Splyce™ can allow you to train harder and for longer because it provides the amino acids that are metabolized directly in the muscle. Not only can this help switch off catabolic enzymes that can break muscle down, it can also delay the fatigue that can hinder a long, hard workout. TMG: Train, Maintain, & GROW!!! In human subjects, TMG has been shown to delay fatigue during exercise, making its partnership with taurine ideal in Splyce™ - but that’s only the beginning. TMG also kept athletes working at full capacity throughout training sessions, supporting steady power, force and intensity significantly in both bench press and squat training. Finally, researchers who have studied TMG as an ergogenic aid in humans hypothesize that one of its key mechanisms is acting as an osmolyte, pulling water into skeletal muscles, increasing size and decreasing susceptibility to fatigue. These are all scientifically validated mechanisms that contribute to Splyce™, the new breed in intra-workout performance. We know that dietary protein intake stimulates muscle growth and we also know that muscle protein synthesis decreases while muscle protein degradation increases during exercise. Ideally, we want to stop these metabolic effectors from putting muscle growth on hold, and digestive processes during training don’t exactly make whey protein the most attractive option to keep this process from negatively affecting your progress in the gym. It turns out that one essential amino acid in particular, L-leucine, is more than just a building block for muscle, but also a pharmacological agent. 1.8g L-leucine alone (one of the three BCAA’s in Splyce™) is enough to elicit maximal muscle protein synthesis in healthy adults. This happens when leucine enters skeletal muscle and activates a growth factor protein called mTOR; however, there are other players in the process that are necessary to keep muscle protein synthesis churning. Specifically, we’re talking about the other two BCAA’s, l-isoleucine and l-valine. One portion (8.95g of powder - 1 scoop) dissolved in 300-400ml of water and consumed during exercise or immediately after exercise. In addition to other doses, it's worth adding a portion before a workout. DRIVEN SPORTS is a manufacturer of products designed for athletes. Among the products of this brand are pre-workout supplements with an innovative composition and supplements increasing levels of men's testosterone, which simultaneously inhibit the catabolism and accelerate anabolism. The company also offers fat burners that reduce cortisol levels, increase thermo genesis and reduce appetite. Malic Acid, Natural and Artificial Flavors, Acesulfame Potassium, Silica, Sucralose, FD&C Red #40.